A LEADING local figure in the UK Emergency Services has welcomed the formation of a new charity for the ambulance services. 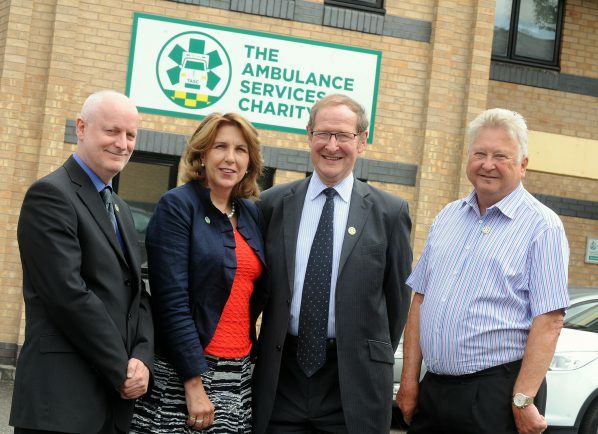 Sir Graham Meldrum, Chair of the West Midlands Ambulance Service NHS Foundation (WMAS) Trust for almost ten years, heralded Coventry-based The Ambulance Services Charity (TASC) as ‘meeting a very definite need’ in the industry following a meeting with the charity’s staff. TASC provides vital support services and advice to serving and retired ambulance personnel and ambulance service families in times of severe difficulty or bereavement – helping secure access to rehabilitation services, mental health services and counselling for conditions including Post Traumatic Stress Disorder. Sir Meldrum, former HM Chief Fire Officer at the West Midlands Fire service (WMFS) met with Chief Executive of TASC, Lorna Birse-Stewart, and discussed how the two organisations could work together in the future to help develop the UK charity. Before joining WMAS, Sir Graham was involved in the fire service for over 50 years – including being HM Chief Inspector of Fire Services for England and Wales – as well as being appointed Chair of the Fire Services National Benevolent Fund, which is now known as the Fire Fighters Charity. Speaking about TASC, Sir Meldrum said the charity provides the whole ambulance services community with their own national charity dedicated to helping and support them. He added: “It also gives the general public, who want to show their appreciation and thanks to paramedics and other ambulance staff who have helped them, the opportunity to make a donation for the benefit of the ambulance personnel and ambulance service families it supports. “Ambulance staff may suffer as a result of dealing with critical situations and exceptional challenges in the line of duty and are sometimes injured themselves trying to give medical assistance in difficult situations so they may need help with support and grants to look after themselves and their families. More information on TASC can be found online at www.theASC.org.uk or via their Freephone Support Line on 0800 1032 999.